I found this Ammophila (Sphecidae) sleeping near the beach at dawn. Catherine, her collaborator Devin and I have been out doing fieldwork with western black widows at Island View Beach near Victoria. The data coming in has been awesome, and I think I have got some awesome images as well! This short field outing has been one of the most productive and rewarding trips I have been on, and it is low-cost and really pretty here as well. When I get some time I will prepare some material for the blog. 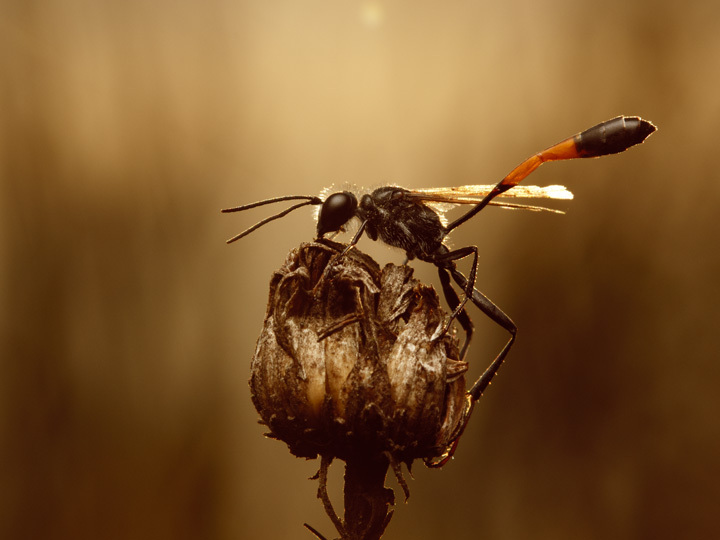 Love the Ammophila shot! This is the largest wasp that I have found in Alberta, quite a thrill when I saw them for the first time.